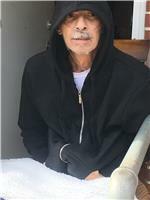 Rafael Antonio Monagas, Jr., of Chipley, Florida, went home to be with the Lord on March 7, 2019 in the comfort of his home. He was 53 years old and a native of Brooklyn, New York. Rafael was born on May 12, 1965 to Sonia Mirella Merriel and Rafael Antonio Monagas, Sr. in Brooklyn, New York. He was a jack of many trades, helping anyone in the community. He will be truly missed. A Celebration of Rafael's Life was held 1 PM CST, Tuesday, March 12, 2019 from the sanctuary of the Grace Assembly of God Church in Chipley, Florida with pastor, Rev. Dallas Pettis, officiating. Committal Services were held Monday, March 18, 2019 in New York with Cooper Funeral Home of Chipley, Florida, and Borinquen Memorial Funeral Home of Brooklyn, New York, directing. The remains were in repose 1hr prior to services at the church on Tuesday. Friends may sign the guestbook online at www.cooperfhchipley.com.